It’s impossible to deny that yoga is becoming more and more popular each day. So maybe you’re asking why?It’s all in the benefits of yoga. Okay, this one is the no brainer. It’s a common misconception that you need to be flexible to go to yoga but realistically, one of the best ways to improve your flexibility is to start yoga. While some postures might seem incredibly difficult in your first class, they will slowly get easier over time. The benefits of yoga start with improved flexibility. Stretching allows your muscles to reach their full range of motion and can help to prevent injuries and reduce back pain and balance problems. Spending half the day slouched over a computer or craning your neck to check your phone is pretty standard these days – and commonly leads to bad posture and pain through the neck and shoulders. When you start yoga, you’ll most likely start to see increased body awareness, which can assist in improving your posture. Yoga helps to strengthen the core, lengthen the spine and balance the body – three key ingredients for good posture. You’ll feel the benefits of yoga on your posture both on your yoga mat and off! Yoga can help to calm the mind and reduce stress – particularly through breathing exercises and meditation. Allowing the body to slow down and focus on breathing (concentrating on the sound of the breath itself) has been shown to help individuals switch their minds from a state of anxiety to one of relaxation. By adding even a few minutes of meditation or stillness to your day when you start yoga, you will begin to tap into your inner resources – slowly becoming less dependent on the resources around you. Through a gentle and selective yoga practice, studies have shown yoga can help lower blood pressure. In most cases, high blood pressure is essentially hypertension and is an independent condition that can be improved through practicing yoga! Keeping the muscles of the body flexible can assist preventing arterial stiffness inside the body. 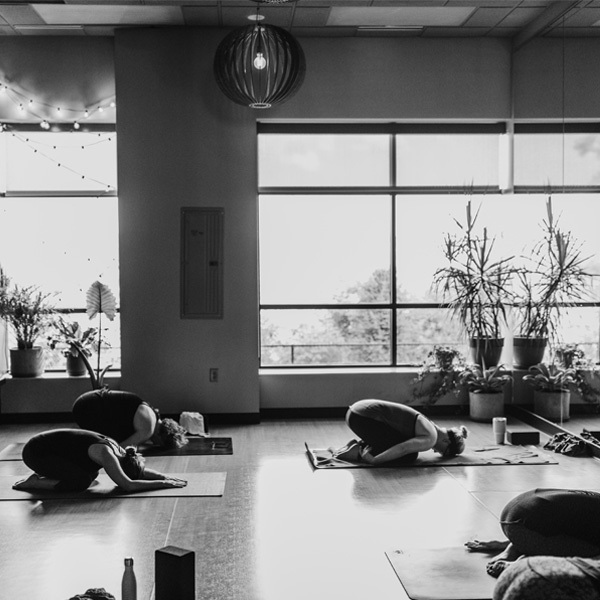 The benefits of yoga also include lowering stress related high blood pressure through breathing and an improved mind-body connection. Start your yoga practice at home with our Yogaholics videos. You can do these in your lounge room, bedroom and even outside on your smart device. See you on the mat!